Would-be spaceman Jeff Bezos' prototype private rocket has crashed and burned after sputtering out during its test flight. 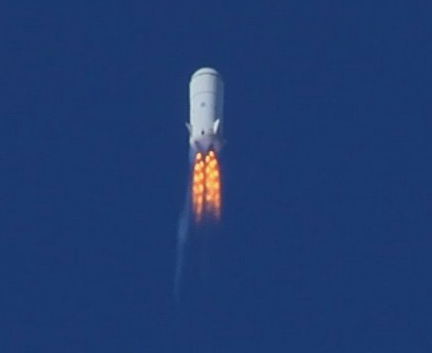 "A flight instability drove an angle of attack that triggered our range safety system to terminate thrust on the vehicle," Bezos said on the Blue Origin company website, which if you're not well-up on flight speak translates more or less to "the damn thing went zipping around the place as though it had a mind of its own so we crashed it". "Not the outcome any of us wanted," he added, "but we're signed up for this to be hard, and the Blue Origin team is doing an outstanding job. We're already working on our next development vehicle." Oddly, the statement didn't appear till nine days after the test flight, which must have been how long it took the Amazon.com chairman and internet billionaire to swallow his disappointment. However, his stated aim with the project is to work "patiently and step-by-step, to lower the cost of spaceflight so that many people can afford to go", so he'll just have to draw on some of that patience until the next test vehicle is ready. Before taking its nosedive, the rocket had reached Mach 1.2 and an altitude of 45,000 feet.